Charcoal is the New Black – Me Paleo. I recently noticed the array of charcoal based and charcoal infused products on the market. When I saw a Proactiv commercial with a charcoal bristle cleansing brush over the weekend, I realized that charcoal has finally jumped the shark. Charcoal is gaining popularity lately for its deep cleaning and detoxification properties. In my own medicine cabinet, I have charcoal capsules, charcoal tooth powder, charcoal face mask goop, and even charcoal deodorant. Intrigued by the concept, I even tried a charcoal based kombucha. That particular yeasty, vinegar tinged, grayish elixir should only be consumed on a dare. Blah! Our water pitcher has a charcoal based filter and our air purifier has a charcoal pre-filter designed to remove odors from the air. The burning question (pun intended)… Does charcoal actually work? Well, aside from the charcoal kombucha, I’m definitely a fan. I take the charcoal capsules on a regular basis for the mild detox effects. The charcoal traps toxins in your system and helps you get rid of them rather than absorb them into your body. Charcoal capsules are not a new concept. I was taking them 20 years ago to mitigate hangover effects from a long nights out coupled with cheap booze. It definitely works! The impurities in the alcohol bind to the charcoal bits and don’t have a chance to wreck your precious weekend with a brutal hangover. These days, I take charcoal capsules to detox all the big city car exhaust, brake dust and other crap in the air I’m breathing. I buy the Bulletproof brand capsules, which are made from coconut shells, but there are a lot of good ones out there. Just be sure to check that they are all natural without any other ingredients and not made by Kingsford for your Weber grill. Also, you want charcoal that is “activated”. By activated, it means that the charcoal has been processed at high heat, which makes it more porous and effective at trapping the nasties. You can actually break open the capsules to DIY a facial cleansing mask, add to your toothpaste, etc. I did that for awhile and then decided to just buy the dedicated products. The Dental Duty charcoal tooth powder is a fun one. Yeah, I have “off-white” teeth, maybe a tinge yellow. I definitely don’t have the sparkling pearly whites that you see on tv. 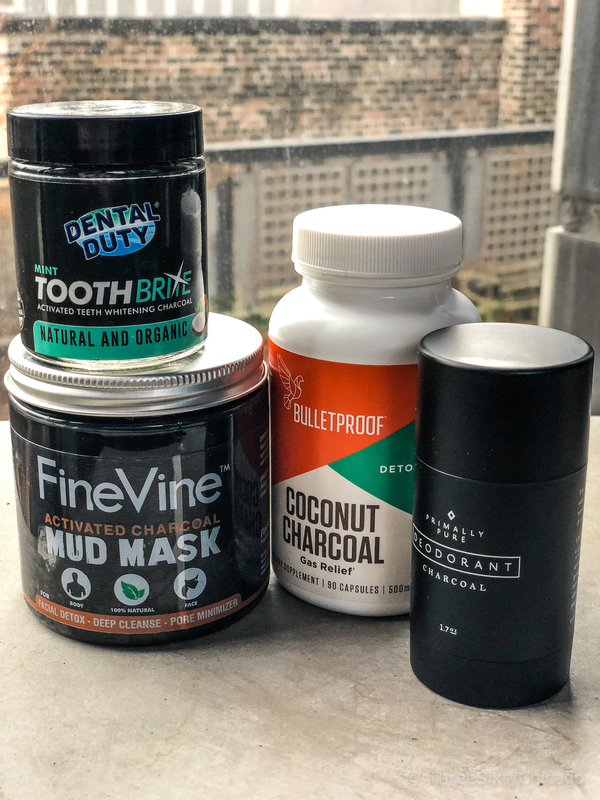 Rather than using toxic tooth whitening products, the charcoal tooth powder is a natural alternative. While brushing with the charcoal tooth power, your teeth look like they time warped from 17th century Great Britain. After you rinse out the dark gray slurry, your teeth are smooth, shiny and a tad more white. They continue to get brighter after several uses. I use the tooth powder a couple times a week after brushing with my regular toothpaste. The Fine Vine charcoal face mask that I use is clay based, so it is more like a mud mask then the fancy clay masks you see people peeling off on commercials. The mask also works great. I use it about once a week. You put it on thick and wait 30 min for it to dry. It dries to a nice dark gray and tingles slightly. Warning: the face recognition on your phone will not work when you have the mask on. When you wash it off, your complexion will be noticeably brighter and will feel deep down clean. Smart phone facial recognition will also return to normal. I tend toward oily skin and this stuff works great to even me out and keep that complexion clear. The last product for today is the Primally Pure charcoal deodorant. This stuff is amazing. I’ve been using Primally Pure deodorants for 2 years and they have always exceeded my expectations. The charcoal deodorant is new to their line up and is my new fave. Obviously, this is a daily use product, but I don’t have to worry about any errant pit odor with their products. Not even after a hot yoga class. All good! Any interesting charcoal products you have used or would recommend trying? I’m game! So fun running into @grahamelliot on the night of the @bravotopchef finale! What a nice guy!